There are many guidelines and expert reviews for management and treatment of non-Hodgkin’s lymphoma which often describe approaches using newer drugs that may not necessarily be available or funded in NZ. Armitage, J. O., et al. (2017). "Non-Hodgkin lymphoma." The Lancet 390(10091): 298-310. Reagan, P. M. and A. Davies (2017). "Current treatment of double hit and double expressor lymphoma." Hematology Am Soc Hematol Educ Program 2017(1): 295-297. Giulino-Roth, L. (2018). "How I treat primary mediastinal B-cell lymphoma." Blood 132(8): 782. Jacobson, C. and LaCasce, A. (2014). "How I treat Burkitt lymphoma in adults." Blood 124: 2913-20. Martin, P. (2017). "Optimizing therapy for mantle cell lymphoma." Hematology Am Soc Hematol EducProgram 2017(1): 304-309. Broccoli, A. and P. L. Zinzani (2017). "Peripheral T-cell lymphoma, not otherwise specified." Blood 129(9): 1103. Grommes, C. and L. M. DeAngelis (2017). "Primary CNS Lymphoma." J Clin Oncol 35(21): 2410-2418. Schiff, D., Hong, F. (2016). "Defining optimal initial therapy for primary CNS lymphoma." Lancet Haematol 3: e206-7. Johnson, P.et al. (2015). "How I treat advanced classical Hodgkin lymphoma." Blood 125: 1717-23. Townsend, W. and D. Linch (2012). "Hodgkin's lymphoma in adults." The Lancet 380(9844): 836-847. See Cheson, B. D., et al. (2014). "Recommendations for Initial Evaluation, Staging, and Response Assessment of Hodgkin and Non-Hodgkin Lymphoma: The Lugano Classification." Journal of Clinical Oncology 32(27): 3059-3067 and Cheson, B.D., Ansell, S. (2016). "Refinement of the Lugano Classification lymphoma response criteria in the era of immunomodulatory therapy." Blood 128: 2489. Re-assessment is often performed after 3-4 cycles of therapy to confirm a response. All patients will be systematically re-evaluated to assess response 3-4 weeks following final chemotherapy administration. Full history and physical examination. FBC, biochemical profile, LDH level. Repeat CT of all sites found to be abnormal pre-chemotherapy. Bone marrow trephine + aspirate, if abnormal pre-chemotherapy. Staging of early stage non Hodgkin’s lymphoma to guide indication for radiation and appropriate treatment fields. Re-staging of residual mass in Hodgkin’s and non Hodgkin’s lymphoma following definitive treatment. Re-staging of Hodgkin’s lymphoma after 2-4 cycles of chemotherapy to inform management options for paediatric patients. Assessment of response to salvage chemotherapy in patients who are candidates for stem cell transplantation. Complete both sides of the PET/CT Imaging Request Form and give the form to Anne Quick, Clerical Supervisor (ext 80399). In practice it is reasonable to follow patients 2-3 monthly for the first 6 months after treatment has finished, then less often, and to consider discharge after 3-5 years. more than one extra-nodal site and disease involving the testes, breast, paranasal, or epidural space. Schmitz, N., Zeynalova, S. (2016). 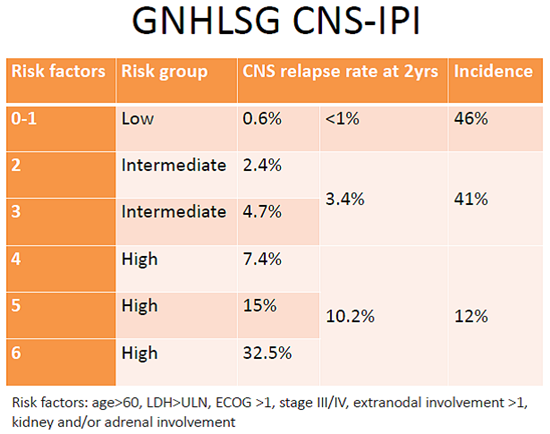 "CNS International Prognostic Index: A Risk Model for CNS Relapse in Patients With Diffuse Large B-Cell Lymphoma Treated With R-CHOP." Journal of Clinical Oncology 34: 3150-6. Chin, C. K. and C. Y. Cheah (2017). "How I treat patients with aggressive lymphoma at high risk of CNS relapse." Blood 130(7): 867. 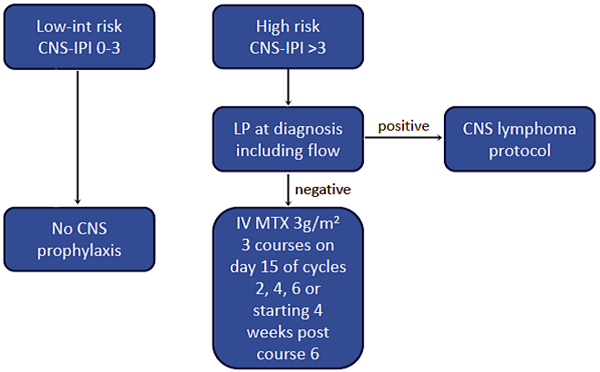 Here is the Christchurch Hospital algorithm for selecting which patients with DLBCL should receive CNS prophylaxis. It is based on the German NHL CNS study group international prognostic index. It goes without saying that wherever possible patients should be offered treatment in any studies for which they may be eligible. There are many very promising new drugs at an advanced stage of development for the treatment of all subtypes of lymphoma. In some cases these are licensed in NZ and more generally overseas. None is funded in NZ as of 2018. Patients may wish to purchase these drugs at their own expense. Some treatment studies available in Christchurch may include some of these newer agents. All treatments below are available in NZ. Some require special authority (rituximab, bendamustine, vinorelbine, gemcitabine, GCSF, and pegfilgrastim) which may be limited to use in certain NHL or to particular stages of disease.